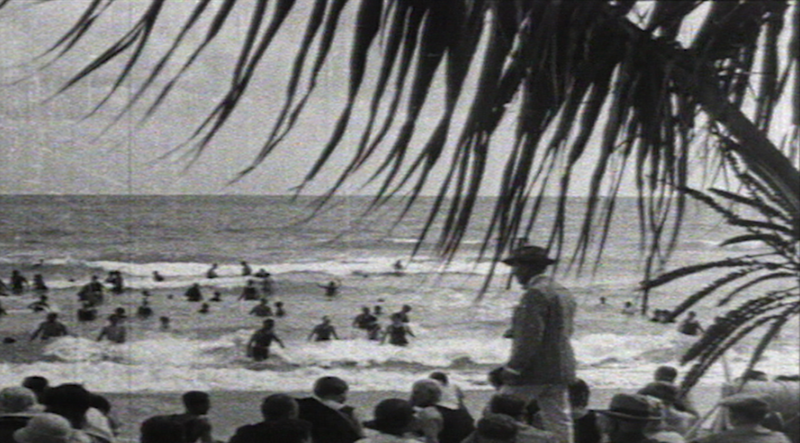 This program looks at how the beach became the place to take a vacation. The development of the Palm Beach area of Florida as THE place to take that vacation and what’s happening in the Palm Beach area these days. The Industrial Revolution got started in England during the second half of the 1700s. It was a major turning point in history and affected almost everything on our planet. The steam engine was invented. The world looks for better things for better living through chemistry, new chemicals were produced. The factory system became the primary way to make things and those factories began making iron. Machine tools were developed. Locomotives began crisscrossing the countryside. Steamships started sailing the oceans. Information started moving around by telegraph. Within 50 years the revolution started taking place throughout Western Europe and the United States. Suddenly, more people had more money than ever before. And they were living in cities and towns with more pollution than ever before. The wealthiest people wanted to take what was called a vacation, a word that previously meant an involuntary absence from work. And one of the most important places for a beach vacation became The Palm Beaches on the east coast of Florida. Now up until the 1750s, nobody really wanted to go to the beach, it’s kind of a scary place. Pirates were there, invaders were there, kidnappers, it wasn’t on your dance card, but then in the 1750’s three things came together to change the image of the beach. The first was a group of medical authorities who kept saying you should go to the beach, breathe the fresh sea air and bathe in the fresh sea water and it would be good for your health. Romantic writers began describing the beach as the ideal place to encounter true nature and painters began painting beach scenes. The perfect environment for escape and self-discovery. And people of wealth begin viewing the beach as the ultimate luxury destination for a vacation. And one of the most popular places for a beach vacation became Palm Beach on the east coast of Florida. Once upon a time, before people had heard much about renewable energy, Henry Flagler, and his pal, John D. Rockefeller, founded the Standard Oil Company, which made them two of the wealthiest people in America and two of the busiest. In 1883, Henry decided to take a break and spend the winter in Florida. Not the kind of guy to just lie around on the beach, he envisioned the east coast of Florida as the American Riviera. So he built the East Coast Railway to bring people to Florida. Problem was, that at some point you had to get off the train and find a place to stay. And there weren’t any hotels that were up to the standard of the head of the Standard Oil Company. So he started building hotels. In Palm Beach, he built the Royal Poinciana Hotel on the Lake Worth Lagoon facing the inland waterway. On the same property, but closer to the beach, he built The Palm Beach Inn. Soon, people who were staying at the Royal Poinciana began asking for rooms near the beach, where the ocean waves were breaking on the shore. So in 1901, Flagler renamed the hotel The Breakers. and everyone lived happily ever after. Sea Turtles have been swimming through the world’s oceans for over 100 million years, but their ability to survive is being challenged and the forces that are confronting the sea turtle are also threatening our own survival. Sea Turtles are part of the beach and dune ecological system. When they nest, they leave behind unhatched eggs, and hatchlings that don’t survive.. As they decay, they form the nutrients that allow the dunes and the beaches to exist. If the turtles go, the beaches and the dunes go and so does much of the land we live on. In 1969, Eleanor Fletcher and her husband Robert moved to Juno Beach, Florida and started a real estate business. Eleanor began to notice that during each spring and summer thousands of turtles would nest on the nearby shore and after hatching many would head inland rather than back to the sea. 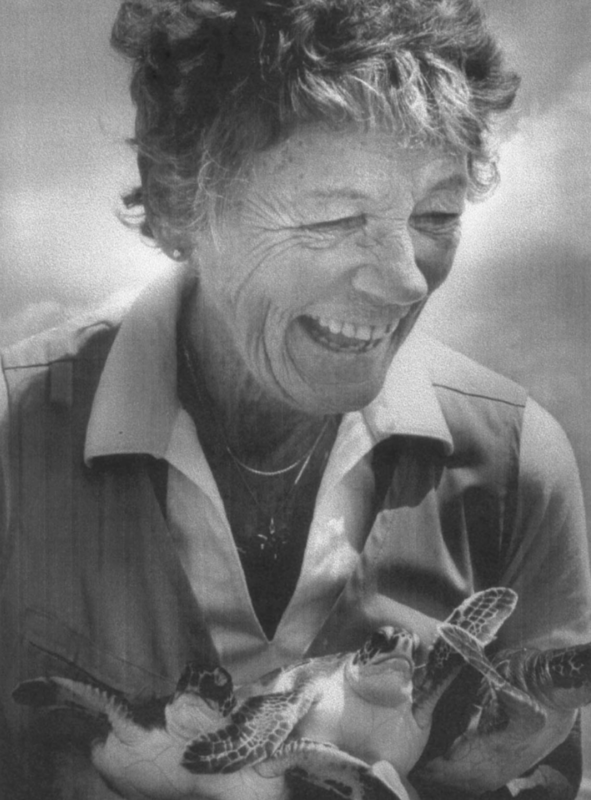 Her curiosity lead to some of the earliest scientific research about turtles in Florida on what turned out to be one of the most important nesting beaches in the world. She realized that as more and more development took place closer and closer to the ocean the sea turtles environment was being challenged. She also discovered that the best way to protect the sea turtle was to educate young children about the problem. She began giving classes in her home, then in a room above her real estate office. These days her work is carried on at The Loggerhead Marinelife Center of Juno Beach. Each year, over 300,000 visitors come to see the exhibits and the sea turtles. 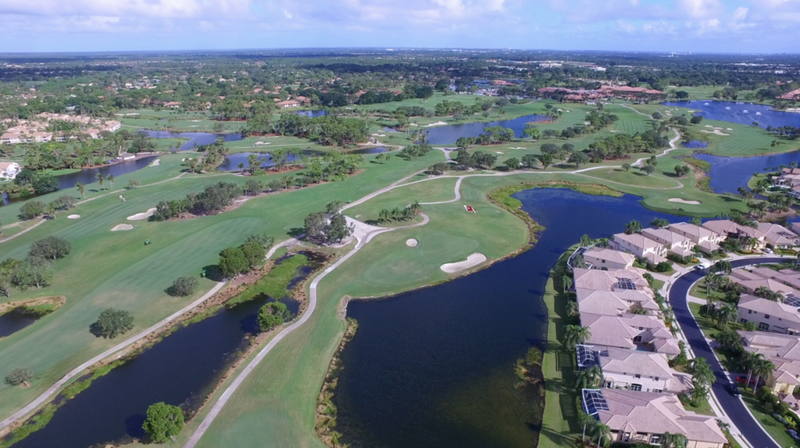 The Palm Beaches is also the home of the Professional Golf Association of America, better know as the PGA. It’s located at the PGA National Resort & Spa in Palm Beach Gardens. 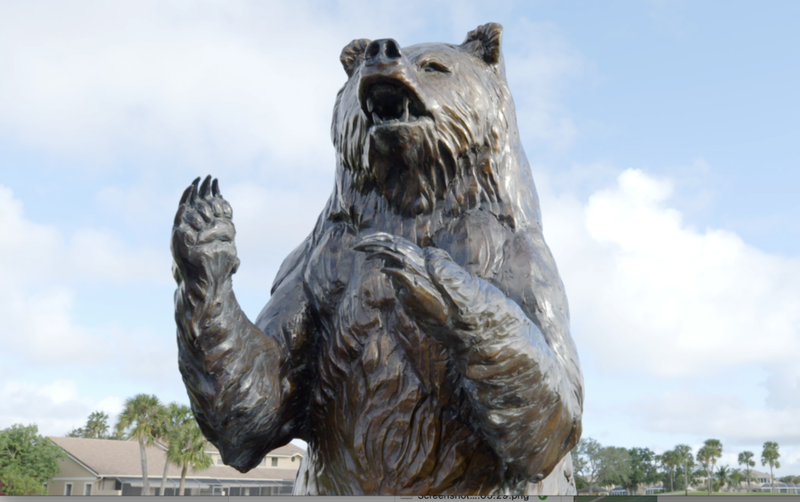 They have five championship 18-holes courses, one of which includes the dreaded “Bear Trap”. The Bear Trap consists of three holes designed to strike fear and loathing into the heart of any golfer. It was named after Jack Nicklaus whose nickname is the Golden Bear. And as you would expect, the bar at the resort makes a perfect Arnold Palmer, which consists of three parts iced tea to one part lemonade. And you know if you get trapped in the Bear Trap, under the PGA rules you are allowed to take a shot of Bourbon and put it on top of your Arnold Palmer. It’s really a quite beautiful place, I mean just to be here whether you’re playing golf, or drinking. About 5,000 years ago, ancient Greeks with medical problems would travel from Athens to Epidauria in the Saronic Gulf. Epidauria was thought to be the home of the god of healing. It’s our earliest record of medical tourism, which is becoming a more and more important part of the tourist business. Basically, medical tourism is when someone goes from one country to another to find someone who can help solve a medical problem. One of the most important facilities related to medical tourism is the Paley Institute here in Palm Beach. Florida. They provide the most technologically advanced treatments for people who suffer from orthopedic conditions. Dr. Paley: For most of these kids and sometimes adults, the only option they’ve ever been given is an amputation and use a prosthesis, which is a reasonable option in some cases, but is over used Probably for over 90% of them, we were able to save the limb, reconstruct the limb and probably closer to like 98% of them by the way and to give them a functional extremity, sometimes literally absolutely normal. Amazing to see a type of tourism that’s 5,000 years old in its modern form. Many of the older buildings in the Palm Beaches are in a style known as Mediterranean Revival or Spanish Colonial Revival. And the architect most responsible for the rebirth of those forms was ADDISON MIZNER. These days his memory’s also honored in downtown Boca Raton with the Mizner Park center. There’s the center for the arts which includes the Boca Raton Museum of Art. The Artfix Gallery which is home to over 600 artists. There are Places to eat and places to shop. Historically, groups of people came together in order to insure their survival. Food, water and shelter are at the top of the list. Once those were reliably available, everyone could turn to more artistic endeavors. Sculpture, paintings, music, architecture, a little literature and some public television, just the basics. And, of course, Palm Beach was no exception. By 1936, there was a general consensus that the area needed more culture and so The Society of the Four Arts was founded. They have a series of unusual botanical gardens. New arrivals to South Florida were struggling with gardening in the state’s tropical climate. In 1938 seven demonstration gardens were set up to illustrate different types of landscaping and information on drought and heat tolerant plants. Next to the botanical garden is a sculpture garden. There’s a general library for adults and a library for children and adults who behave like children. 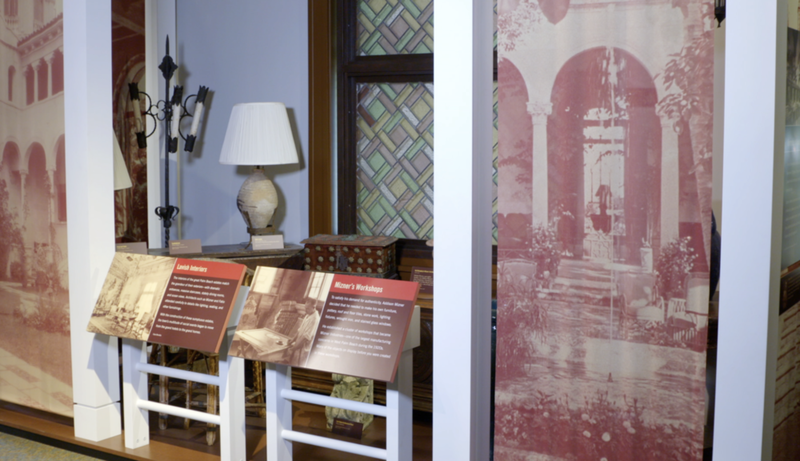 An art gallery designed by Addison Mizner, with changing exhibitions. The building has a 700-seat auditorium with a state of the art sound system where they present the live broadcasts of the National Theatre of London, The Bolshoi Ballet and The Metropolitan Opera. This is the Atlantic Avenue Shopping district in downtown Delray Beach. Shops, restaurants, and a nice place to take a walk. Every year, the local firefighters put on a huge St. Patrick’s Day Parade. Next door is The Crest Theatre, which is in the restored Delray Beach High School that dates back to the 1920s. The Crest Theater only has 323 seats, which can give it a sense of intimacy. They offer Broadway shows and stand-up comedy in cooperation with Catch A Rising Star. 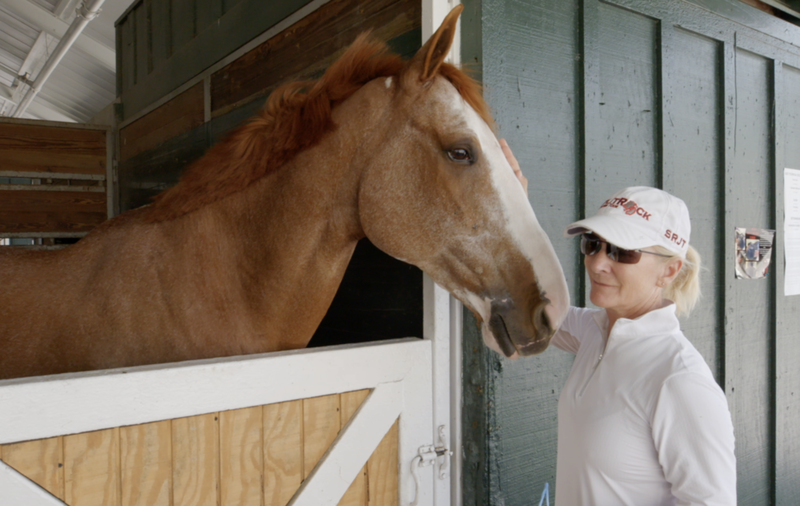 If you are interested in serious horsing around the place to visit is THE PALM BEACH INTERNATIONAL EQUESTRIAN CENTER. Horses have been around for about 55,000 years. About 6,000 years ago, someone decided that we could work together, which turned out to be a great idea. The first horses to be brought to the United States were brought by Spanish colonist who set up our earliest cattle ranches. Horses have some very interesting traits. They have a highly developed sense of fight-or-flight, which was key to their survival in the wild. They have an outstanding sense of balance and amazingly can sleep while they are standing as well as when they are lying down. Being able to sleep while you’re standing is a particularly valuable skill, I learned it many years ago, and it allowed me to sleep through major portions of my family gatherings. These days the horse is celebrated at the Palm Beach International Equestrian Center, which is considered to be the premier equestrian sporting venue in the World. Over 8,000 acres totally devoted to horsing around. The surface of the competition arenas, know as the footing has been upgraded to Olympic quality. I hear they are considering a series of Internet sensors, which would prevent the Russian hackers from influencing the horses. 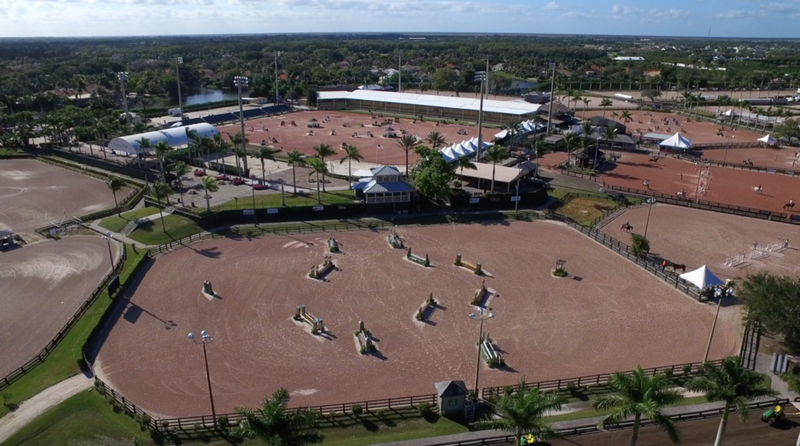 The 12 competition rings are part of the equestrian show complex used to demonstrate skill levels in various categories like: Jumping, Hunter, Dressage , Driving , Polo And Western/Trail riding. This is the Historical Society of Palm Beach County, which is housed in the old Palm Beach County courthouse. The courthouse was built in 1916 in the neoclassic style. At the time, neoclassic was the preferred architectural style for government buildings. People thought that the ancient Greeks understood how to run a government and by building government buildings in that ancient Greek style the structure would convey a sense of strength and credibility. 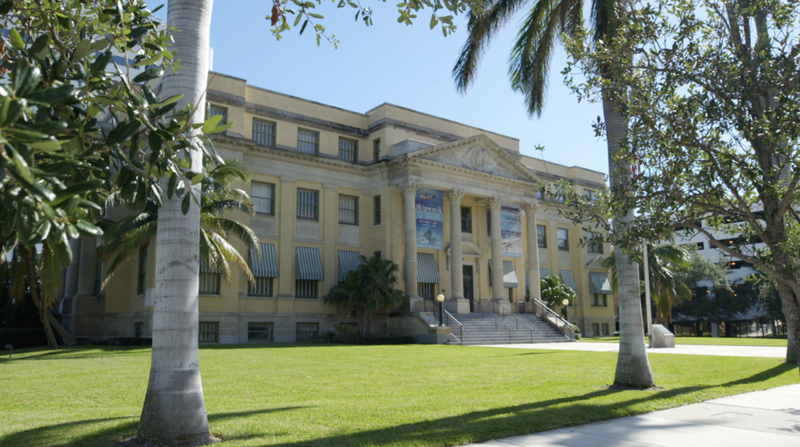 The Historical Society was formed in 1937 with the objective of collecting various artifacts and documents that represented the history of Palm Beach County dating back over 10,000 years. If you would like to learn the new sport of stand up paddleborarding, or practice your Kayaking skills, or take a snorkeling tour, then the Jupiter Outdoor Center is the place for you. The nearby clear waters are home to manatees, dolphins and sea turtles. You might also find nesting pelicans, great blue herons and osprey. In addition, you can visit a number of historic sites, including the Jupiter Inlet Lighthouse . And the Dubois Pioneer Home which is built on and ancient native American shell mound. These mounds have been around for thousands of years. Originally this mound was considerably longer and higher. About 200 feet in length and about 40 feet high with a brightly painted building on top and if you venture a little further inland you might come upon the homes and natural habitat of my film crew. But if you do, it’s important to remember not to feed them. If you do, they’ll want a nap. This is the federally designated Loxahatchee River Wild and Scenic Area. Benji Studt: There was a wild and scenic rivers act that was passed by congress back in 1968, and that gives these wilderness areas extra protection. The best place to start if you want to experience the wild and scenic portion is Palm Beach County's Riverbend Park. When you come down here and your in a canoe and your in a kayak you're going to be paddling next to ancient cypress trees covering the river almost the whole way. It winds between big cypress knees. The river systems are so important because of the habitat they provide. There are many rare species that use these areas. 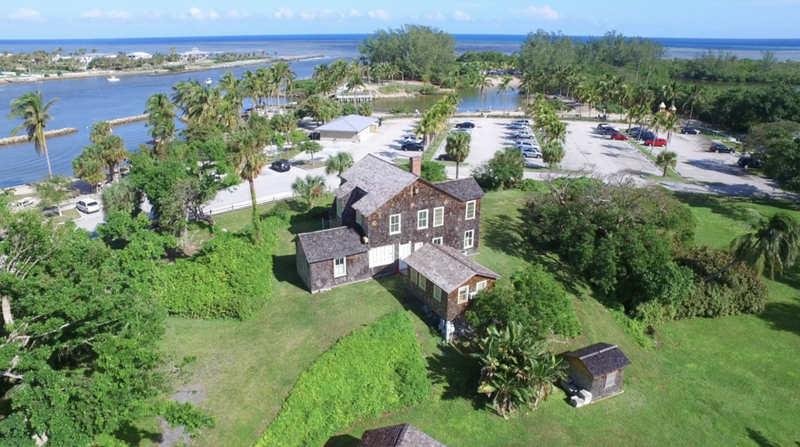 Where the river meets the ocean is the Dubois House, which was built by one of the earliest settlers to the area. And it was built on a shell mound. A shell mound is an architectural formation that the native Americans in Florida would build and the higher ups in the tribe would be on top of the shell mound and the village would be around the outside of the mound. The only part of the original mound is were the homestead is located. The mound is made of oyster shells and contains pottery fragments and other archeologically significant items. My favorite period in the history of American Baseball ran from 1900 to 1919 and was know as the “Dead-Ball period”. In those days, the cost of a baseball would be about $100 in today’s money. So the club owners tried to use the same ball throughout a game. By about midway in the game, the ball was misshaped from being hit with the bat and covered with mud and tobacco juice. The teams had security guards who retrieved balls that were hit into the stands. Home runs were unusual. The game featured bunts, stolen bases, hit and run plays and some questionable pitching tactics. The scuffs on the ball fostered the development of spitballs, shine balls, knuckle balls and other deceits that produced an unnatural flight path for the ball. 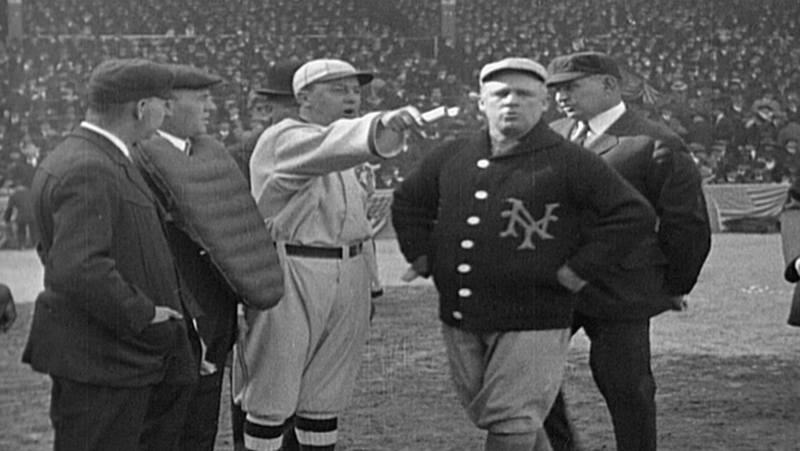 The Dead Ball period came to an end when a rule change in 1920 required the umpires to put a new ball in play whenever the old ball was scuffed. The new and livelier balls favored the long ball hitter like Babe Ruth. 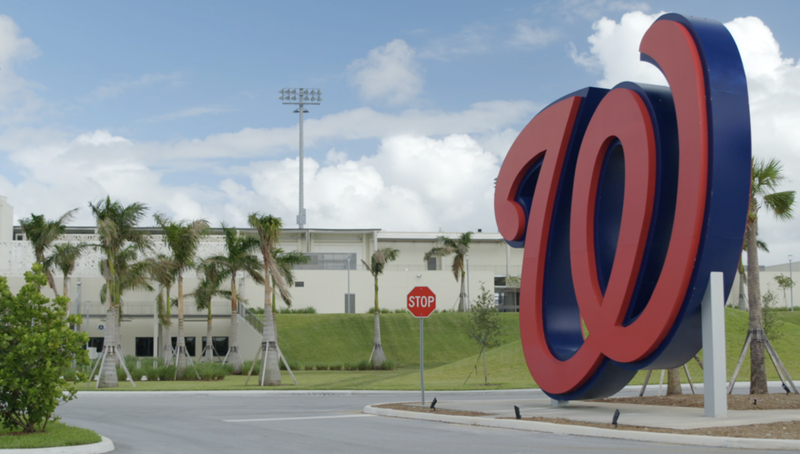 The modern stadium is designed to promote the homerun hitter. The Babe would have loved this place. The Boca Raton Museum of Art was founded by artists rather than philanthropists, which is rather unusual. The Sculpture Garden presents life-size figurative works, large-scale abstract monuments and one of Riccardo Illy’s favorite sculptures --- a tower of coffee cups. In front of the entrance is Marty’s Cube, which is almost identical to New York’s Astor Place cube. However, neither Marty’s nor the Astor Place is related to Rubik’s cube, or ice cube. A psychedelic mural by South Florida artist Jose Alvarez. 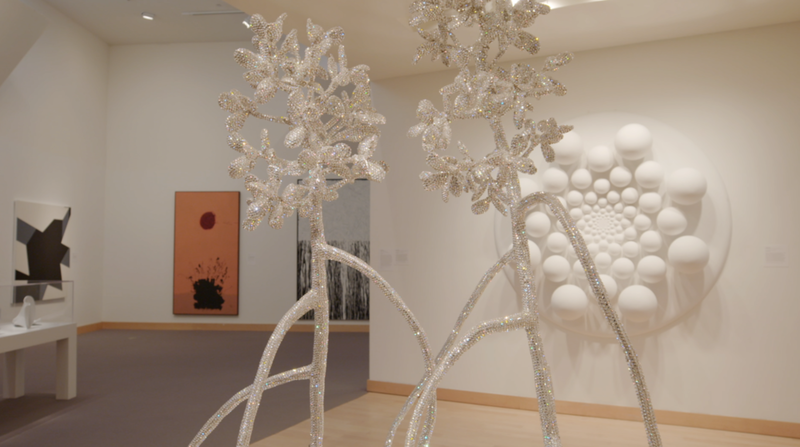 A sculpture of a mangrove tree made of 85,000 crystals. The nearby Art School teaches more than 100 classes each week in a variety of mediums. Folks who never thought they could paint, come to this school and discover their talent. 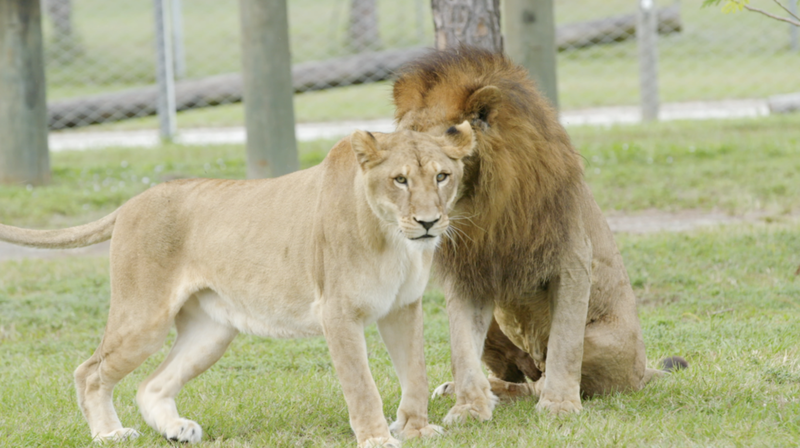 Next up was a visit to the Lion Country Safari Park near West Palm Beach. You drive through the park in your own car as long as it’s not a convertible. As you drive along, you listen to a recorded narration that explains what you are seeing. In essence, you are driving through a cageless zoo. The idea of a cageless zoo is not a new concept for me. In fact, it is a perfect description of my home when my three older sons were teenagers. 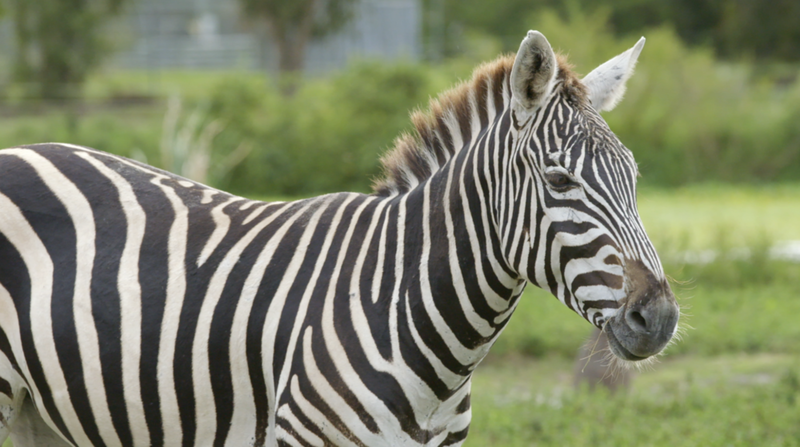 As you drive along, you’ll see giraffes, zebras, rhinoceroses, lions, chimpanzees and an occasional retired federal official. Lion Country Safari has a large heard of Scimitar-Horned Oryx which are extinct in the wild. As part of a species preservation program they share animals with other zoos in order to breed them and keep the population expanding. The sharing program helps to diversify the species DNA. A similar program with the California Condor at the Loss Angeles Zoo resulted in the birds being released back into the wild and thriving. Of particular interest is the chimpanzee exhibit. They live on an island system where they move to a different island everyday. Which is similar to their natural nomadic lifestyle. A key to their well-being, as it is for most travelers, is to pack lightly. In 1978, Alexander Dryfoos and a group of business leaders formed the Cultural Council of Palm Beach County. It’s objective is to increase the cultural activities in the community and encourage professional artists. Surprisingly, cultural activities are a major part of the local tourist economy. Tourists who come to Palm Beach to take part in local cultural activities spend over 300,000 nights each year here, create 11,000 jobs and bring in hundreds of millions of dollars. They have exhibitions that feature local artists. Shows range from paintings, to sculptures, installations, sound, prints and photos. From abstract works to beautiful Florida landscapes. The building was built in 1940 as a movie theatre in a streamline modern style that was popular in the Art Deco period. The architect did nothing but build movie theaters all over Florida and Georgia. Cultural tourism is a priority for the Cultural Council. Fishing can be divided into three categories. Fishing because fish are an essential element in your diet and you need fish to survive. Fishing because it’s the way you make a living. And fishing because its your sport. And like most sports, sport fishing needs a clubhouse. This is the West Palm Beach Fishing Club and it was founded in 1934. It has about fourteen hundred members. Some are families that fish together. Some are kids that love the sport and not to learn about it. And some are seasoned pros that are in the game to win a tournament. The idea is very simple. Get into a boat. Get the boat into the warm waters of the Gulf Stream that runs just off the Palm Beach shore. Catch the biggest fish you can. Weigh it. Release it. And prove to everyone that you did it. 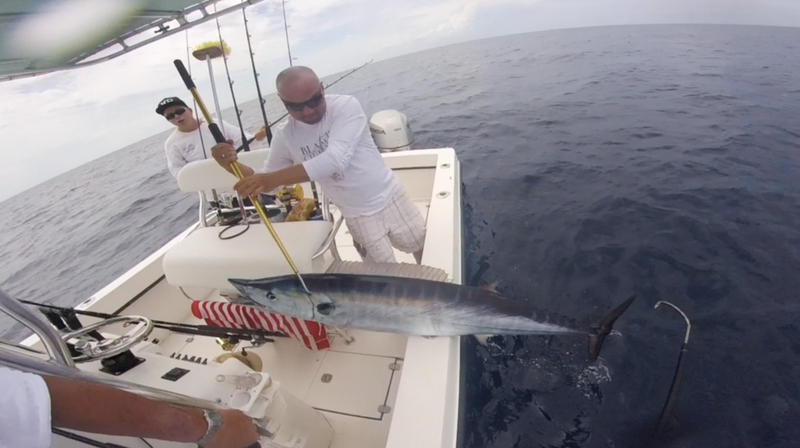 The Palm Beach Club was one of the first organizations of its kind to get involved in catch and release programs. It was called the Red Release Pennant project and the objective was to get people involved in sport fishing to release the sailfish the caught rather than bring them back to the dock were they died. There’s and annual Silver Sailfish Derby, which is the oldest continually running billfish release tournament in the world. Even the Old Man Of The Sea, Ernest Hemingway sponsored a West Palm Beach trophy. If you’re in the neighborhood, stop in. There’s always someone around happy to explain the history of salt water sport fishing And to talk about the huge one they let get away. Big-game fishing is considered a recreational sport. Mostly by the people doing the fishing. Less so by the fish. It was founded in 1898, by Frederick Holder, a marine biologist and early conservationist. Special boats built for game fishing appeared in the early 20th century. They featured a deep cockpit, a chair fitted for landing big fish and leather pockets to hold the fishing poles. 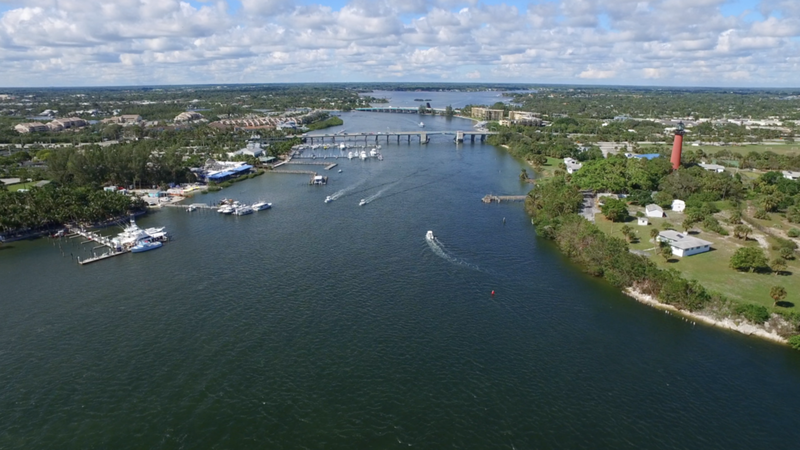 The Palm Beaches area in Florida was one of the earliest centers for big game fishing and is still one of the world’s leading destinations for sport fishing. The warm Gulf Stream that runs up along the east coast of Florida is home to many of the big fish --- including sailfish, tuna, marlin, swordfish and shark. As it passes the Palm Beaches area, it is the closest it comes to the shore so fishing boats can quickly reach the fish. The cost of a fully equipped big game fishing boat can be considerable. The boat itself, the tackle, the mooring fees, the insurance, the maintenance, the expert captain, the beer coolers. Which is why many people prefer to charter their big game boat. And Palm Beach has one of the world’s biggest sport fishing charter fleets. There’s another newer stye of getting offshore that appealed to me as well. It’s called luxury fishing and cruising and the vessel is appropriately equipped for the task. We boarded the "Gallant Crew” in Lake Worth and got underway. Captain Kevin Gallant explained the concept. You can cruise the intercostal waterway and take in the sights. Enjoy a glass of champagne and relax, or head offshore in search of The Big One! Proof positive, of my deep sea fishing skills. Well, that’s a look at the history of the beach vacation and what’s happening in The Palm Beaches, Florida. I hope you will join us next time, as we travel around the world trying to figure out what is going on and why. For Travels & Traditions, I’m Burt Wolf.